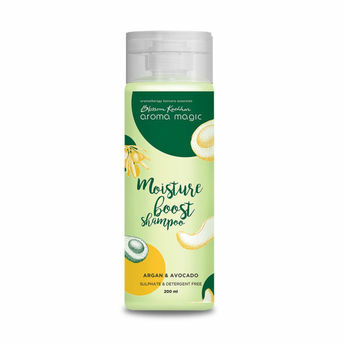 The Aroma Magic Moisture Boost Shampoo is a pure blend of chamomile, lavender and argan essential oils that helps retain the moisture level and strengthens hair from within. This shampoo leaves behind soft and strong tresses. Avocado and grapefruit extracts increase the blood circulation in the scalp and helps in better growth of the hair, making it silkier, softer and shinier. Shower your hair with love and nature with this unique creation from Aroma Magic. Explore the entire range of Shampoo available on Nykaa. Shop more AromaMagic products here.You can browse through the complete world of AromaMagic Shampoo .